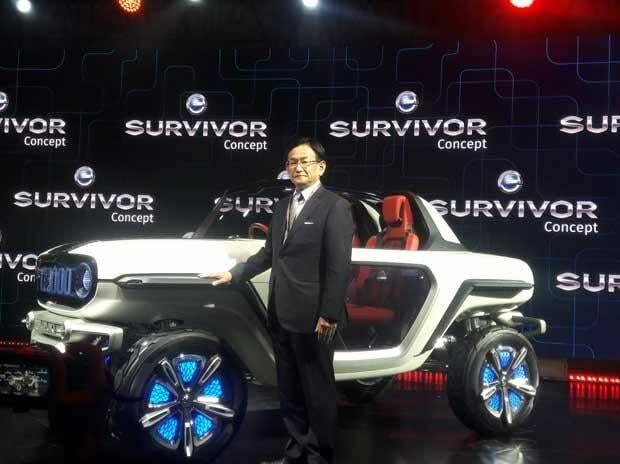 Maruti Suzuki on Wednesday unveiled an electric concept car, e-SURVIVOR at the Auto Expo here, as a part of its commitment to clean vehicle technology for future. The company is getting ready to launch a locally developed electric car by 2020. “In this concept SUV, the proud 4-wheel drive heritage of Suzuki combines with electric capability, to offer fine control and outstanding mobility. 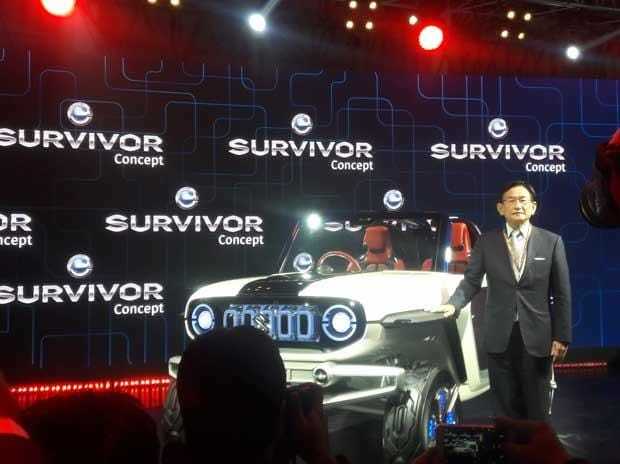 The e-SURVIVOR is equipped with autonomous driving capabilities,” said Kenichi Ayukawa, managing director and chief executive officer at Maruti Suzuki. The company’s parent Suzuki has partnered with Toyota to work towards introducing electric vehicles in India. India’s vision is to bring down emissions substantially, reduce dependence on imported fuel, and secure a leadership position on clean technology capability, he said. “At the same time, we recognise that there is a larger vision behind electrification of powertrains. Products alone will not be enough to realise this grand vision. India will need a comprehensive ecosystem that supports cleaner technologies, including electric vehicles,” he said. That ecosystem will include local production of components, capabilities for battery manufacture and recycling, stated Ayukawa. “Of course, we will need a vehicle charging infrastructure of a scale and size that matches India’s needs”. He stressed that the vision of cleaner technologies cannot turn true through an ‘import and assemble’ approach. “It must go hand in hand with the mission of Make in India”. He listed sourcing of raw material, vehicle maintenance, skilling and reskilling of people, disposal and recycling (of used batteries) as critical parts of the ecosystem for electric vehicles. Maruti Suzuki is examining various options to support vehicle charging infrastructure in the country. Ayukawa said the company’s approach will cover the entire lifecycle of an electric vehicle, and help build a clean and sustainable future for India’s automobile industry. Showcasing a working model of a hybrid vehicle, Ayukawa said hybrid has tremendous potential and significance in the company’s holistic approach to cleaner technologies for India. “It will move alongside the electric vehicle vision”. The company said hybrid and electric vehicle technology share the same core technology items, including lithium-ion battery, electric motor and inverter. “Improving efficiency of conventional engines with hybrid technology can reduce emissions substantially, and help bring down India’s fuel import. More important, hybrid can start working for us almost immediately, as the eco system for it is largely in place”, said Ayukawa. It is estimated that during the years it will take for the EV market to mature in India, several millions of conventional internal combustion engine vehicles will be sold in the country. Maruti Suzuki believes that deploying hybrid technology on large number of such vehicles, will bring massive benefits, in terms of both emissions and fuel saving.